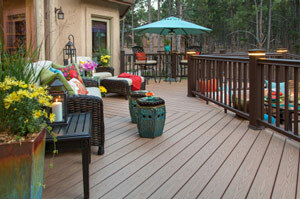 A well-planned deck design can transform your yard into an area for relaxation and entertaining. 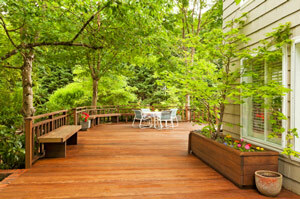 A deck is also an affordable way to expand your living space. All-In-One Home Solutions will work with you to design and build a deck that fits your exact needs. We can install a ground-level, raised, or multi-level deck that compliments your landscaping and the style of your home. We offer a wide range of materials to choose from, including wood and low-maintenance composite decking. We build decks using only the best quality products from leading manufacturers. Call us at 1-844-385-7881 or click below to request your design consultation and get a free quote for deck installation in Salem, Roanoke, Bedford and surrounding Virginia areas. Why to Choose Vinyl: Vinyl decking products are now available in styles that look like wood but won’t warp, splinter, rot, split or blister. Dirt can be washed off with a sponge and hose or with a pressure washer. Vinyl is a durable, low-maintenance option that will provide long-lasting quality. Composite decking, aka engineered wood products, come in a bewildering number of variations. Some offer solid boards while others are hollow. Some are “capped” or “co-extruded” with a layer of PVC while others are not. Some require multiple components for assembly while others are more like building with wood. What is common to all is they are made with recycled fibers, plastics, and binding agents. 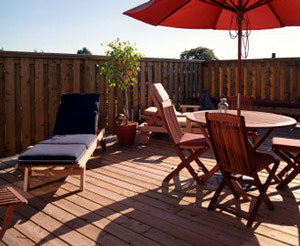 Why to Choose Composite: Like vinyl decking, composite decking is pre-finished. 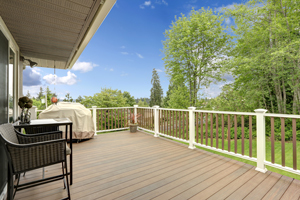 Composites create the appearance of real wood decks, but they don’t need staining or painting and require little maintenance. Dirt can be washed off with a mild detergent and a hose. Composites are environmentally friendly, too. Up to 95 percent of materials used in manufacture are from recycled sources. They include materials as diverse as wood flour, rice hulls, and plastic containers. Size and shape: Decks are often thought of as distinct outdoor “rooms.” There may not be any walls, but your deck may need to accommodate a cooking area, a dining area, a spa area, and a lounging area. Traffic flow: For decks upon which a variety of activities take place, it’s important to plan for traffic flow. Comfort: A deck isn’t going to get used when the sun is blistering hot or when it’s raining. Ask us about roomy retractable awnings that provide protection from the elements without cluttering up the deck. If you can dream it, the experts at All-In-One Home Solutions can build it! If you're considering adding a deck to your home, contact us to request a free estimate for your project in Moneta, Vinton, Rocky Mount, Boones Mill, Cave Spring, Blue Ridge, Troutville or nearby.